Tactical Asset Control and Tracking (T-ACT), is a small-boat, command, control and information system that supports maritime domain awareness and allows the Northern Border Initiative (NBI) Control Center to track and analyze multiple targets on the water. The Command and Control Center (CCC) can securely track Patrol Craft (PC) and display their location to within GPS accuracy in near-real time. PC can also track and display the locations of other PC. Text messages can be securely exchanged between the CCC and PC or between the PC; both point-to-point and broadcast messaging is supported. ECPINS integrates with other sensors and systems such as shore-based radars, databases (e.g., the IHS Fairplay Register of Ships and Shipscape) and systems which send or receive feeds of contact information (e.g., GCCS-M), offering interoperability with current and future Coast Guard, NBI and DHS systems. Portable and robust, T-ACT integrates into each NBI patrol boat’s existing radar system, providing the Control Center a common operating picture of small boat traffic on Lake Erie – current operating pictures are fragmented and incomplete. With the aid of an LCD monitor and joystick, NBI boat crews can see exactly where they and other NBI boats are located for real-time situational awareness and greatly improved boat safety. Using an encrypted AIS transponder that provides a “free-to-air” data link and the addition of secure text messages and route plans, the Command Control Center can optimize the deployment of the NBI boats to investigate and prosecute contacts of interest. T-ACT solutions provide law enforcement, military and security operations with a tactical advantage and a direct enhancement to operational performance, security and safety of critical assets, people, and equipment. The UK Police Authority and Canadian Navy have deployed this technology, as did the Canadian Port Security Unit during the 2010 Winter Olympics. With each mission success, invaluable feedback is received and applied by us to further product improvements. 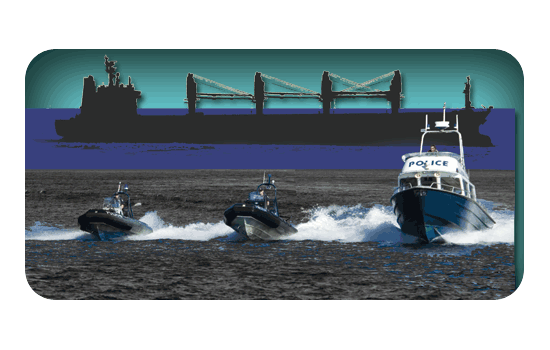 T-ACT Video – Tactical Asset Control & Tracking allows the User to conduct a variety of Maritime Security operations. Detailed and accurate planning supports the operation and the simple exchange of instructions helps derive maximum Operational Capability of the available assets.